A little late for Festivus, but I wanted to give us all a chance to partake in an important aspect of the Holiday. The Airing of Grievances. What about the Lions drives you crazy? Let it all out here! LaGarrette Blount has gotten the majority of carries this season, but has been the least productive and least exciting option all year long. He's also a negative in the pass game. Averaging a stunningly low 2.8 yards per carry, he's out performed by everyone who gets a chance to carry the ball, yet they keep forcing Blount into the game. I agree with you about Blount. What drives me crazy is once again, here we are 6-10. What makes it worse is the season, for the most part, was boring. There were flash’s but that’s it. i would expect it will be a defensive prospect in the first but hey, who knows, they’ve been selling whatever they do for decades. I see the bright spots but bright spots don’t matter at this point, to me. My #1 grievance is that Patricia looks like a disaster. He talks and looks like he's Lionized after only one season and that's no good. Think the thing I hate is we haven't had a gm worth a ****. Why is this low franchise hiring rookie gms.. you see Cleveland figured it out. Then you hire coaches that put 50yo blunt out there really...... no one wants to see that **** show us something with some gd promise.. ANYTHING! And quit filling holes that are so dam obvious a yr or two late.. it truly makes me wonder if Quinn has even watched a game..
Oh we need ol.. let's put guys next to each other with no compliment skill set.. I've aired my concerns since the off-season started basically... Everyone that told me give them a chance, etc, etc, has quit posting or worst, like Diehard pointed out, are rationalizing quite a bit and already looking to next year and "give him a chance" attitude again, " watch what we'll do with new WR's and offensive coaches. " Yeah sure, wake me up when this whole staff is gone. Top to bottom. Cardinals did the right thing moving on from there first year head coach imo, Lions should be cleaning house, right now, and looking for a GM/Coach before the superbowl ends. But, whatever. Fords/Lions organization have made a lot of money from this team over the years and attention stays high without ever really trying to win so like unless they get lucky why start really trying now? Can't wait to see the bargain signing of the year we'll get like Shead, Wesley Johnson and Wiggins! Please, please go get Koetter, Patrica. Koetter was accused of being outdated and bad the past couple of years. Mondkin was supposedly the guy that was making the offense good and koetter took the play calling away from him. Not sure I want him based on what I’ve heard. Perhaps but when he had a good qb, he did pretty good. 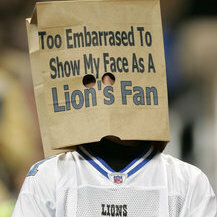 This is the least confident that I have been in the Lions in a very long time. Even when the team went 0-16 I was optimistic that they would right the ship and be good in the future. I just don't have any confidence in either Patricia or Quinn being the right guy. Patricia looked completely lost at times and really seems like a guy more suited to being a coordinator than a head coach, and I'm just not thrilled with where Quinn has taken the roster. He talks a ton about building depth, but the team hasn't really had many players step up when guys go down. The trade for Snacks and the 2018 draft seem like they were both really good so far, but I haven't seen any evidence of this team being more than mediocre in the future. Not sure where else to post this, so I'll do it here. I don't think the story this is referring to, Patricia's indictment from 1996, is a big deal. But this response is just asinine. Quinn barely speaks, and when he does he sounds foolish. Couple that with some bad drafting and hiring a buffoon for a coach and this guy that was supposed to be some kind of wunderkind is looking like another disaster. I thought the same thing. Background checks get ran on almost every potential employee these days. When looking at a potential employee as high profile as a NFL head coach, there's no excuse. At least he should have asked if there was anything in Patricia's past that would embarrass the organization. That's a pretty simple question to ask. I thought Quinn was too smart to give an answer like that, but I guess not. The allegations are from 1996, so even if they are true they are past the statute of limitations, so he wouldn't even face any charges let alone actually serve jail time. If you watch the whole 40-minute presser, Quinn actually came off really well. The quote where he says he isn't paid to do background checks is a small quote of a longer answer that really is a fine response to the question asked. He just set himself up for clickbait articles by answering part of it in a way that could be taken out of the larger context. Just another example of the organizations incompetence. There’s no excuse for not uncovering this type of information.